Newspaper article in the Sanford Herald on the City of Sanford's donation of land to the State Marketing Board to construct the Sanford State Farmers' Market in 1934. The tract of land was in a desirable location due to its proximity to both east and west farms, as well as its location near French Avenue. Photocopy of original newspaper article: "City Donates 20-Acre Tract for Market." The Sanford Herald, June 20, 1934: State Farmers' Market Collection, Museum of Seminole County History, Sanford, Florida. Original newspaper article: "City Donates 20-Acre Tract for Market." The Sanford Herald, June 20, 1934. 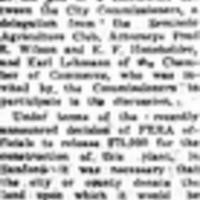 Digital reproduction of photocopied newspaper article: "City Donates 20-Acre Tract for Market." The Sanford Herald, June 20, 1934. The Sanford Herald, June 20, 1934. The Sanford Herald, June 20, 1934, page 1. The northwestern corner of Alex. V. French properties at Thirteenth Street and French Avenue, comprising 20 acres, was offered to the State Marketing Board this afternoon by the City of Sanford as a site for the proposed $75,000 Florida State Farmers; Wholesale Distributing Market. Decisions to donate this property was unanimous, and it came at the end of a conference between the City Commissioners, a delegation from the Seminole Agriculture Club, Attorneys Fred R. Wilson and E. F. Housholder, and Karl Lehmann of the Chamber of Commerce, who was invited by the Commissioners to participate in the discussion. Under terms of the recently announced decision of FERA officials to release $75,000 for the construction of this plant, in Sanford it was necessary that the city or county donate the land upon which it would be constructed. Twelve sites were surveyed by the Agriculture Club committee, and the French property was considered as one of the most satisfactory. Despite the fact that the city secured title to the French property as well as the result of foreclosure action, both City Attorney Wilson and County Attorney Housholder agreed that the State Marketing Board would be handed a clear title to the property, [?]. The 20-acre tract is considered as most advantageously located. It borders French Avenue, a main artery of traffic between Sanford and Orlando. It also borders 13th Street which is closely connected with short-cut roads leading from both the east side and west side growing areas. It is immediately adjacent to an Atlantic Coast Line railroad branch line track, an an announcement was made that a spur could be run directly on the property without much additional expense. 13th Street; ACL; Atlantic Coast Line Railroad Company; chamber of commerce; City of Sanford; farmers' market; Federal Emergency Relief Administration; FERA; French Avenue; French, Alex V.; Housholder, E. F.; Lehman, Karl; Sanford; Sanford City Commission; Sanford State Farmers' Market; Seminole Agriculture Club; State Marketing Board; Thirteenth Street; Wilson, Fred R.
“City Donates 20-Acre Tract for Market.” RICHES of Central Florida accessed April 24, 2019, https://richesmi.cah.ucf.edu/omeka/items/show/1147.